The Phoenicians left their racial cradle on the north coast of the Persian Gulf in approximately 200 B.C. to settle in Tyre and Sidon on the east coast of the Mediterranean. From there they sailed to colonize Cadiz, Carthage and Marseilles and the islands of Corsica and Sardinia. 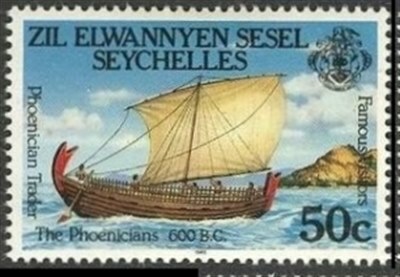 The Phoenicians, or Sidonians as they called themselves built stout, seagoing sailing vessels of up to 300 tons displacements. 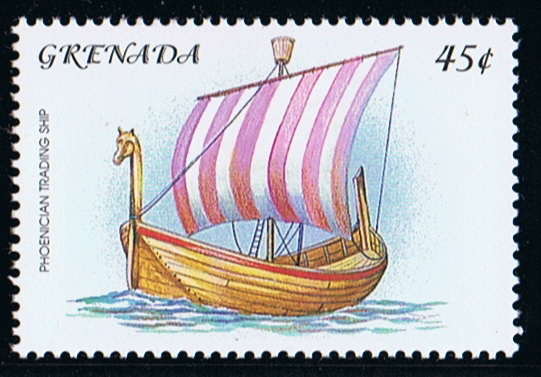 These had many of the features of both Cretan and Egyptian ships, were single-masted and could only sail with the wind, relying at other times on slave oarsmen. The stem-posts were carved to resemble horses ‘heads’ and the inward curving sternpost took the form of fishtails. 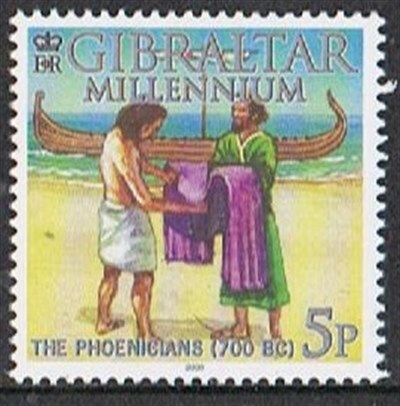 Piracy was rife; thus, Phoenician trading ships were always heavily armed. Grenada 2001 45c sg?, scott? Gibraltar 2000 5p sg?, scott? Zil El Wannyen Sesel 1985 sg 125 scott 111. 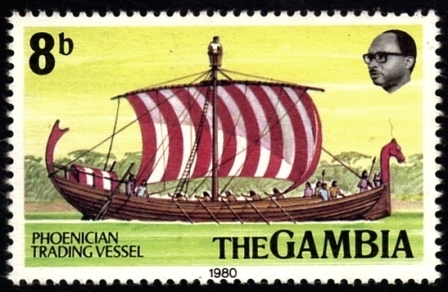 Source: copied from Sailing Ships and Sailing Craft by George Goldsmith-Carter.